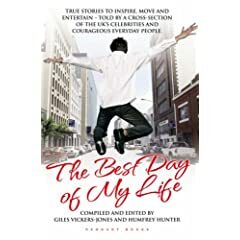 A new anthology entitled "The Best Day of My Life" has just hit the shelves. It brings together a load of short stories by people like Phil "The Power" Taylor, Mike Gayle and Sophie Kinsella talking about - unsurprisingly - the best days of their lives were. For a sneak preview, click here and you can read the moving story by James Corden (from Gavin and Stacey). It's all for charity (The Sporting Chance Foundation), so put your hand in your pocket. Go on. Also included are James Crossley (formerly 'Hunter' off Gladiators) and little me.